Rock Island - Milan Parkway is a controlled access expressway encircling the south side of Milan from Illinois 5 to U.S. 67. Coupled with 92nd Avenue West and Centennial Expressway (IL 92), the expressway forms a beltway around Rock Island. An unnumbered route, the parkway was completed in 2007. 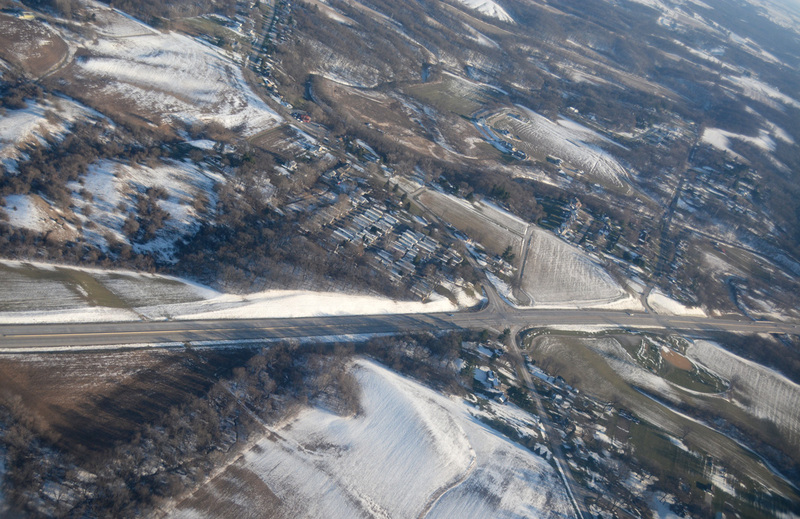 Aerial looking eastward above the intersection of Rock Island - Milan Parkway and Knoxville Road. Photo taken 03/15/17. 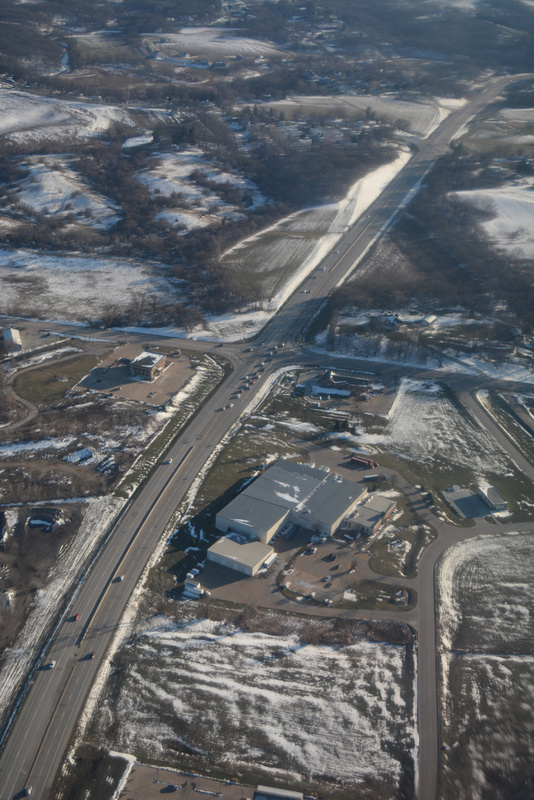 Southward aerial of Rock Island - Milan Parkway at 78th Avenue. Photo taken 03/15/17. Rock Island - Milan Parkway extends south from a parclo interchange joining IL 5 with 46th and 52nd Avenues in Rock Island. The expressway spans the Rock River to Airport Road. Photo taken 03/31/16. Hennepin Canal Trail accompanies the southbound lanes of Rock Island - Milan Parkway across the Rock River. Photo taken 03/31/16. Passing over Interstate 280, southbound motorists enter the parclo interchange with Airport Drive. 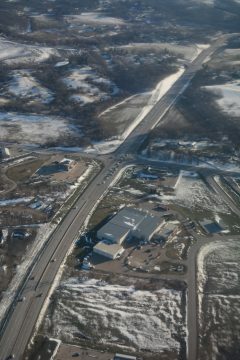 Airport Drive connects the parkway with I-280 to west and Quad City International Airport (MLI) to the east. Photo taken 03/31/16. A traffic light operates south of Airport Drive for an unnamed road to the John Deere Parts Distribution Center and an adjacent industrial park. Photo taken 03/31/16. Curving southwest, Rock Island - Milan Parkway approaches Indian Bluff Road (County Road JJ). CR JJ leads east from Milan to the general aviation facilities of MLK Airport and U.S. 150 near Coal Valley. Photo taken 03/31/16. Indian Bluff Road continues west from the parkway to Knoxville Road (CR 7) in the village of Milan. Photo taken 03/31/16. Rock Island - Milan Parkway advances 0.4 miles southwest to intersect Knoxville Road (CR 7). Photo taken 03/31/16. County Road 7 (Knoxville Road) meanders 7.8 miles southeast from Rock Island - Milan Parkway to 99th Street in Rural township. Knoxville Road continues from the end of CR 7 to IL 17 at the village of Windsor. Photo taken 03/31/16. The parkway turns west from Mill Creek to Camden Park in south Milan. Photo taken 03/31/16. Rock Island - Milan Parkway ends at an unmarked intersection with U.S. 67 across from 92nd Avenue West. U.S. 67 leads north to the Milan village center and south through adjacent Oak Grove. Photo taken 03/31/16.